Posh central defender Christian Burgess is available for transfer. Dons used the loan market wisely on their way to automatic promotion from League One last season. Strikers Benik Afobe and Will Grigg were borrowed for long spells from Arsenal and Brentford respectively and helped the team to a division-best 101 goals and a second-place finish. Chairman Darragh MacAnthony revealed recently that Posh are expecting to bring in a couple of young, quick strikers from Premier League clubs to aid last season’s top scorer Conor Washington. “Ideally I would have the entire squad for next season together when we return for pre-season training on June 29,” Robertson said. “That isn’t likely to happen purely because Premier League players might be involved and their clubs won’t let them out that early. “I’ve seen a couple of Premier League clubs in an attempt to forge a strong relationship with them, but if I do loan players I want them here for the whole season so that they can buy in to our thinking and our way of doing things. 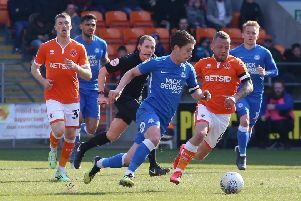 Posh have not enjoyed a great deal of success borrowing players from top flight clubs in recent seasons. Spurs winger Kenny McEvoy was a massive flop last season. Posh have made one signing - former West Ham midfielder Jack Collison - since the end of last season, but negotations with several transfer targets are understood to be at an advanced stage. Luton striker Mark Cullen and Bolton’s attacking midfielder Sanmi Odelusi have been linked with Posh this week. Cullen was believed to be on the verge of signing for Posh last season until then manager Darren Ferguson was dismissed. Odelusi impressed on a loan spell at League One rivals Coventry last season. Posh director of football Barry Fry , the man in charge of transfer negotiations at the ABAX Stadium, has been at the Football League chairman’s conference in Portugal this week. Fry has also been working hard on getting shot of the club’s transfer listed players. Three League One clubs are understood to have shown an interest in Jack Payne, while central defender Christian Burgess is a target for a couple of League Two teams. Rotherham United’s interest in Joe Newell has cooled, while £500k striker Luke James is believed to be interested in a move back to his native north-east, although, with Posh unlikely to get much of their investment back on the 22 year-old, the club are leaning towards loaning him out in the hope he discovers some form. Robertson added: “Barry Fry is working night and day to get players in an out of the club. “We’ve had inquiries about a couple of our players and we will have to wait and see what develops.